NetSuite ERP provides a plethora of benefits for your business. However, you can enjoy these benefits only if your ERP implementation is geared for success right from the onset of the project. How do you ensure it? Find out now. Choosing an ERP is a major business decision – you’ll have to consider several factors, evaluate the long-term benefits, and pick a platform that fits your business now, as well as in the future. You need a platform that is flexible, agile and scalable, one that continues to help your business as it grows. 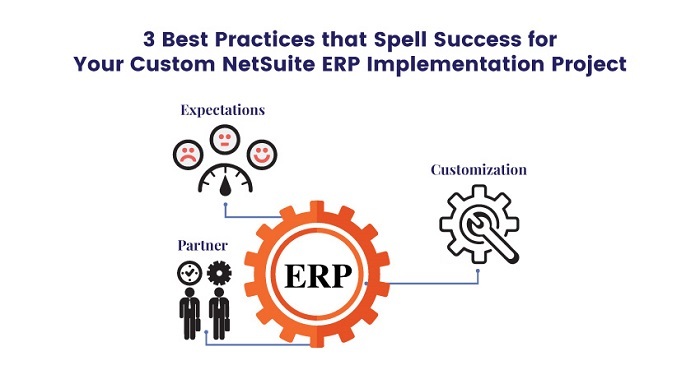 This is why – NetSuite is one among the leading ERPs preferred by businesses across industries. The cloud-based platform is flexible, scalable and easy to use and learn. With that said, choosing a great ERP platform is just the beginning. Customization and training are the other elements that play a crucial role in ensuring that your NetSuite implementation is a massive success, and proceeds without any glitches. Today’s advanced ERP solutions like NetSuite have a wide range of functionalities and features. By implementing an ERP solution out-of-the-box, you end up with features that aren’t relevant to your business. On the other hand, you miss out vital functionalities that are specific to the requirements of your business. To ensure that the ERP implementation is successful, you need to opt for top-down customization. This brings us to the next factor. This is one of the most important factors you have to consider during the NetSuite customization process. You need the right team with the right technical prowess to get the job done perfectly. While choosing a NetSuite partner, ensure that you look into the team’s working methodology and track record. An excellent NetSuite implementation partner not only completes the deployment on time but also stays within the budget. The team must provide you with a clear roadmap for the entire project – right from requirement analysis, design, validation, testing, training, and user adoption. Additionally, it’s essential to look for teams who have significant experience in customizing the NetSuite implementation to suit your specific business requirements. It’s true that a powerful ERP solution like NetSuite can provide a wide array of benefits to your business like – lowered IT costs, seamless customer data, efficient inventory management, shorter order-to-cash cycle, and faster deliveries. With that said, migrating to a new ERP solution involves plenty of work and is often time-consuming. Very often, business owners assume that the new ERP solution will provide 100% returns from day one. That’s unrealistic. You need to consider the time taken for training employees, providing them with on-boarding, guiding them with usage and more. Taking a phased approach to NetSuite implementation works the best. Set small achievable goals, reap the benefits of each phase, and then move on to the next phase, instead of trying to do it all at once. By working with the right NetSuite implementation partner, you have a trusted team, who provides you with expert assistance each step of the way. They help you plan the project judiciously, and make the right decision, helping you get the most out of the implementation. Are you ready to find the right NetSuite implementation partner?